[by Róisín Curé in Galway] When I drive into Galway City, I stick to the coast road. I live about twelve miles south of the city on the coast, so it's a straight run in. I park outside Claddagh Church, right on the edge of the water. I love the Claddagh, a distinct coastal enclave just west of the River Corrib, where the city meets the Atlantic Ocean. When I came to Galway in the 1990s, there was still a King of the Claddagh, acknowledged as such by Galway insiders. You wouldn't know he was royalty to look at him (we're not really into airs and graces in Ireland) but I was told that people paid homage to him. If a tourist board had wanted to design a chill-out oasis in a city, they would have come up with something a bit like the Claddagh. After the craziness of Quay Street and the Latin Quarter (whoo-hoo!) it's nice and peaceful. The view is lovely, as the colourful houses of The Long Walk on the east bank of the river always look charming with the ever-changing sky rising behind them, and because the river forks at the mouth there are different grassy promontories where you can sit. On a fine day, there will be many bare-chested men drinking beer from cans lolling about, but they're harmless enough. It's one of my favourite places to sketch. 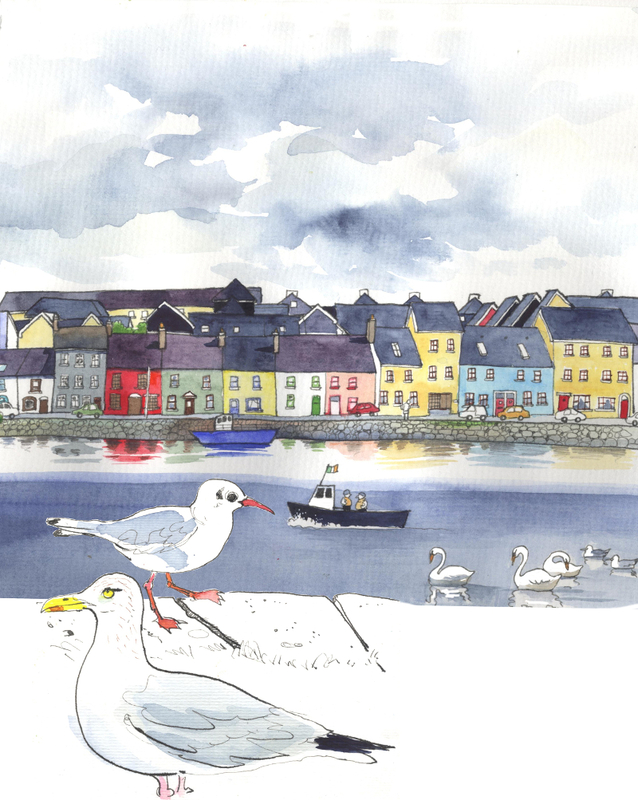 Last July, Marc Taro Holmes, Shari Blaukopf and I held an urban sketching workshop in Galway City, and the Claddagh provided many of the scenes we sketched. 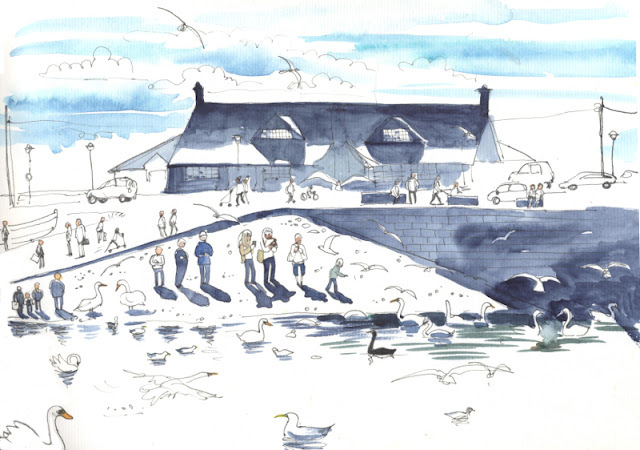 It's where I first sketched with Shari, and I love to think of all the different interpretations of The Long Walk in sketchbooks which now live in France, Portugal, Spain, the US and the UK and even Australia. And when wandering urban sketchers fetch up in Galway and get in touch for a sketching session, we usually end up in the Claddagh somewhere. Last week I had a special reason to go and sketch. A single black swan had joined the myriad white ones who call the Claddagh home, and I thought she'd make a nice subject. Apparently she comes from Australia but there's no way she came all the way here from there - I mean, I know we're basically the number one tourist destination in Ireland, but wouldn't she have got a little tired en route? 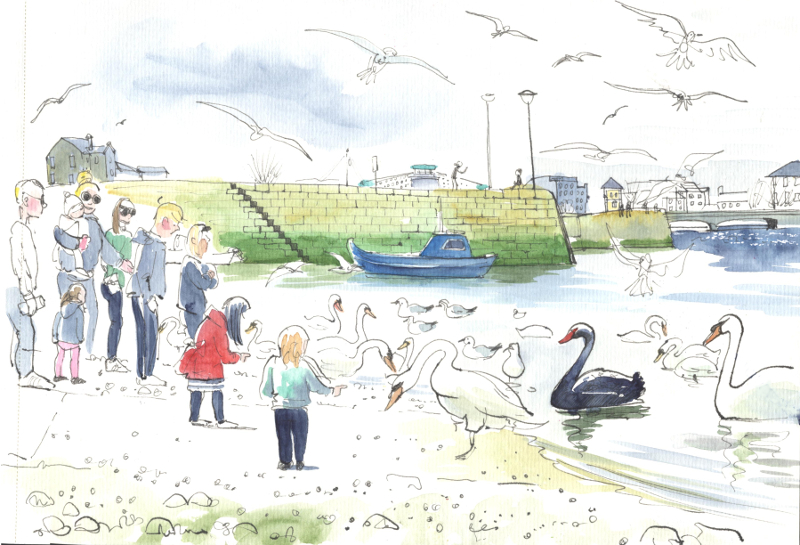 Once I looked across the small stretch of water from my grassy spot to the shore where the swan was being fed, however, I found the people filming the swan to be more interesting - the essence of urban sketching, which is really about recording the culture. The morning sun was strong and made for lovely shadows. Later I went across to join them, and had a closer look at the swan. She was a beauty - I really should have made a formal portrait rather than a quick sketch - and she preened her lovely body and appeared totally nonchalant to all the onlookers. You can see a guy with a can on the left, but happily for everyone he didn't take his top off. I told my mother-in-law about the lone black swan, and how beautiful she was. My mother-in-law comes from an age when a girl's beauty was her only currency, and she still sees it as something to flaunt and gloat about. "The white swans must be jealous," she said. I told her that if they were, they hid it well, but she was probably thinking that they were pretending they didn't care so as not to look desperate. I love my mother-in-law and the Machiavellian world she inhabits, and I hope I'm that feisty when I'm nearly ninety. I'll be back to the Claddagh soon for more sketching. Who knows what exotic foreign lady seagull will just waltz into Galway and nick all the Irish seagulls off the local birds? I'll be there to record all the catfights for mother-in-law and the urban sketches for you guys.